Since our family Easter activities were Saturday night and Sunday morning, I was free to chase Sunday afternoon. The setup looked good - a strong surface low would move southeast across Illiois from its noon location in Iowa slightly southeast of Des Moines, with a warm front extending southeast along a line from near Burlington, IA to between Springfield and Bloomington to about Champaign-Urbana. A Pacific cold front or dryline extended from the low southeast to near Keokuk to just east of Quincy and then southwest across Missouri to near Springfield, MO. Directional shear was good, making supercells possible both ahead of the cold front/dryline and along the warm front. I thought the best chance of tornadoes might be with any storms approaching the warm front. With storms beginning to fire in west-central IL, I decided to head out toward Springfield around 12:30. A stop at the rest area south of there to check radar on the DTN weather center showed three distinct storms along a north-south line, with the strongest a little southwest of Springfield and two other weaker, but also discrete, storms along a line to the south toward around Carlinville. Since the storm near Springfield was the strongest, I decided to intercept it, and soon it was severe-warned. As I entered Springfield, I observed that the storm was looking quite intense, with very dark bluish color to it, and a lowering along the southeast edge. I was not, and am not, quite sure how to classify this lowering, although it seemed somewhere between a wall cloud and a shelf cloud. As it moved across the western, then northern, parts of the Springfield area, it produced wind damage and large hail, and seemed to turn a little more to the east. I exited at the IL route 29 exit, figuring I could go no further north without risking getting in the core of the storm, something I did not want to do, especially in a metropolitan area. After stopping to take a few pics, I headed east from Rochester toward Mt. Auburn to 1) try to keep where I could watch this storm to my north and 2) avoid getting overrun by the next storm south, which seemed to be intensifying, and would have overrun me had I not moved east rather quickly. As I neared Mt. Auburn, the outflow from the storm approaching from the southwest kicked up a lot of dust, and perhaps a brief gustnado a half mile or so ahead of me. I finally managed to get ahead of it near Mt. Auburn, and turned south there to see if I could see the updraft region of this storm as well as to see what was farther down the line to the south. This storm did indeed have small wall cloud, but other storms down the line were approaching rapidly and appeared to be merging into the storms to the north, so I continued to work my way southeast along the section roads to try to stay ahead of the storms. After working my around an especially nastly-looking core, I encountered the most interesting structure of the day so far somewhere to the northwest of Assumption and northeast of Taylorville. I am not exactly sure where, but I think it was farther from Assumption than where a tornado was reported two miles west of there a little after three. I believe the time was around or a little after three, though. Anyway, once I cleared the leading edge of the core, I observed a very large rotating wall cloud, which rather quickly developed a nice RFD notch. And under the RFD gust front/flanking line, I noticed a large, localized cloud of dust off to my southwest. This subsided for a while, then kicked up again. It was a little too far away to tell visually whether or not it was rotating, but the second time I did notice a definite lowering above where the dust was rising. Hence, I figured that the dust may have been a plume under the RFD gust front that was moving straight toward me, or it may have been a gustnado or a spinup. 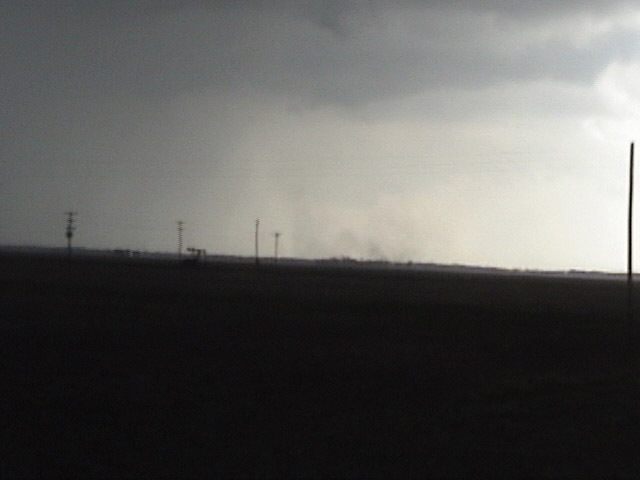 Here is a video capture of the dust cloud and the lowering above it, and here is a more zoomed video capture. After review of the video, I was still unsure as to what this feature was. Things that led me in the direction of thinking that this was indeed a brief spinup tornado are 1) the lowering directly above the dust cloud, 2) the fact that, while I could not tell for sure whether or not it was rotating, the dust was, at the least, moving at different speeds and possibly different directions, and 3) the vertical edge at the left side of the dust cloud, suggesting upward motion and rotation. Things that led me in the direction of thinking it may merely have been blowing dust from the RFD gust front include the fact that in an earlier photo, there appeared to be dust rising in a number of places, not just under the lowering, which would be more suggestive of outflow. UPDATE - after posting this report, I had email communication with Dave Hoadley, who followed a general route similar to mine and observed the feature described above, but from a shorter distance and from the opposite side. He confirms that it was a tornado, since he observed rotation both in the dust and in the clouds above it. There were two spotter reports of tornadoes from this storm, both of which NWS Lincoln viewed as sufficiently valid to confirm. 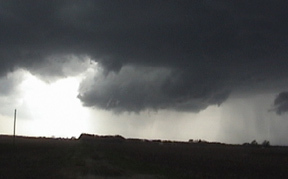 The first was around the time I observed these features or a little after, about 2 miles west of Assumption. Since there did not seem to be anything to my southeast toward Assumption except rain from the next storm down the line, I am wondering if this feature may have been what led to the tornado report west of Assumption. I do, however, think I was a little west and north of the location where that report came from. Dave's communication with me confirms this - the spinup tornado that he and I observed occurred farther west than what is indicated in the report, and likely a little earlier. In any case, the combination of this event and the strongly-rotating wall cloud just to its northeast made for an exciting few minutes. The inflow into the wall cloud was so strong that I could hardly get the car door open to get out and take pictures of the rotating wall cloud. At the time I observed this storm it was SVR warned, but shortly after I left it, it became tornado warned due to a second report of a brief tornado 7 miles north of Assumption. By that time, however, I would have been overrun by the core of the next storm south, and the precip from that storm quickly hid the meso from my view. As it was, I got blasted by heavy rain, strong southerly wind, and a few small hail stones as I hightailed it east to get back ahead of this latest storm. Similar to the process I had observed with earlier storms, this southern storm seemed to merge into the storm just to its northwest that produced the rotating wall cloud. I got back ahead of this storm and blasted south on U.S. route 51 through Assumption and toward Pana. Soon this storm went tornado warned, as it seemed that nearly every storm in the area was now doing. Actually, this storm had become somewhat linear, with two updraft areas, one just west of Assumption and another to the southwest of that. I stopped to view and videotape it for a while, but then noticed much better-looking, and more isolated, storms farther down the line to the southeast. These storms, too, were tornado warned, first for the area around Ramsey south of Pana, and later eastward toward Lake Shelbyville. Yet another storm to the south of that one was also tornado warned, and seemed to be moving roughly along I-70. Since these southern storms were looking awesome and the tornado-warned storms to my northwest were looking less impressive, I made the difficult decision to break off the tornado-warned storms I was watching to my northwest and blast off to try to get to the ones to my southeast. I blasted east on route 16 toward Shelbyville, then south on 128 toward Cowden, where I had to cut to the west to get around thw storm's core and, hopefully, get on the forward side of the storm. After getting around the first storm, I noticed a truly impressive-looking storm to my southeast, closer to I-70. 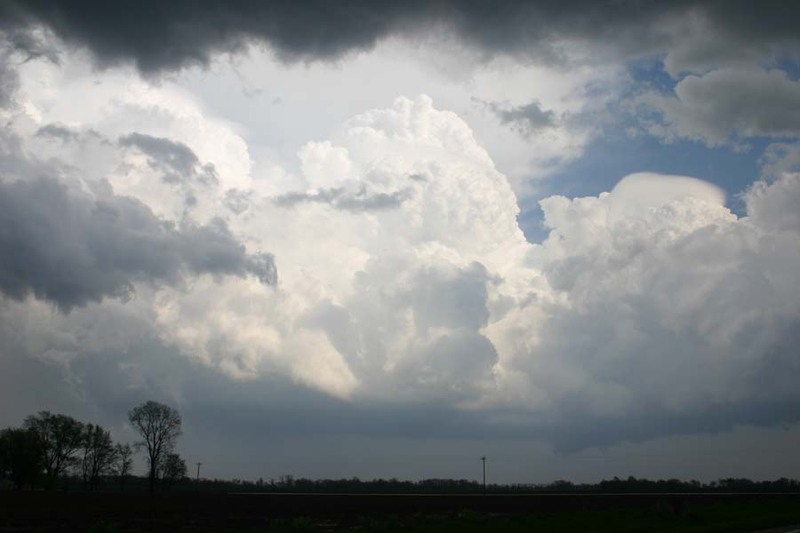 I worked my way southeast toward Effingham, as I watched the rock-hard towers of this storm continue to develop. By the time I got near Effingham, this storm was looking really good - it had developed a wall cloud right under a growing updraft tower, all of which I could see well even though I was approaching the storm from the back side, i.e. from the northwest. However, around the time the storm began to really go to town, I made a navigational blunder and ended up dead-ending in a residential area around Lake Sara. I had to backtrack to the north to route 33, which ran from WNW to ESE through Effingham and toward the storm. By this time, the wall cloud had become tight and round, and the updraft surged to the top of the storm, with the wall cloud right under the main updraft. Everything about it said this storm was about to produce! 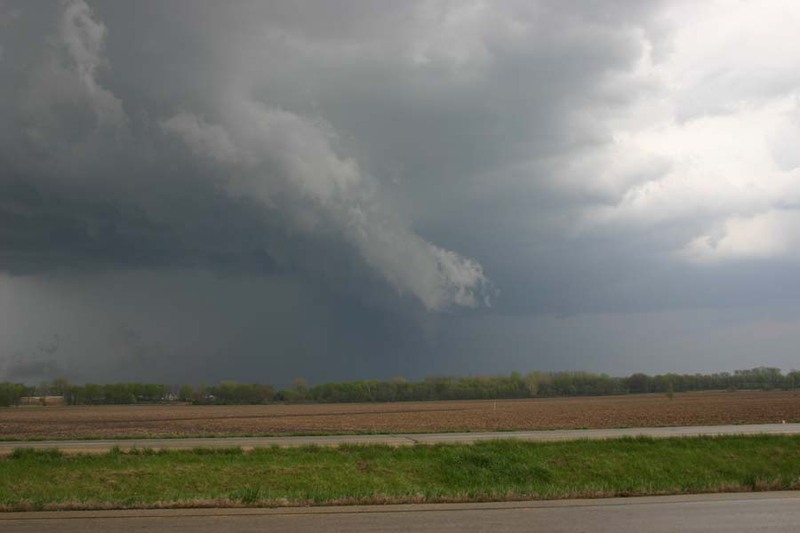 And produce it did - just as I entered the town of Effingham a few minutes after 5 p.m., I saw a narrow, slightly concave cone funnel come down from the wall cloud. Almost immediately, the NWR announced a report of a tornado southeast of Effingham, right where I saw it come down. By now, though, I was in heavy traffic in town, and although I grabbed my camera and tried to get a shot, the tornado had disappeared behind a building. I saw it for somewhere between 15 and 30 seconds before losing it in town. A few minutes later I got a brief glimpse of what was probably one side of the large dust swirl it pulled up after a few mintues, but by the time I finally made it through town (seemed like FOREVER! 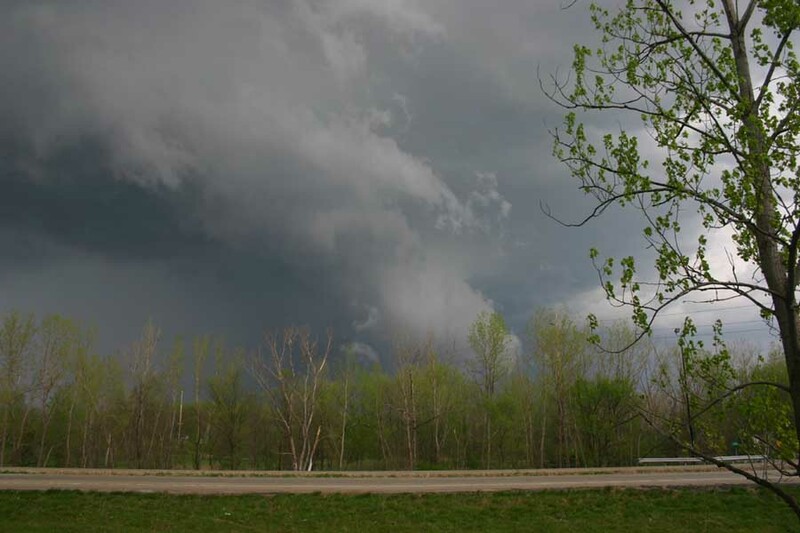 ), the meso was rain-wrapped and the tornado was either gone or hidden by the rain. I am disappointed that I was unable to photograph the tornado, but pleased that at least I saw it. 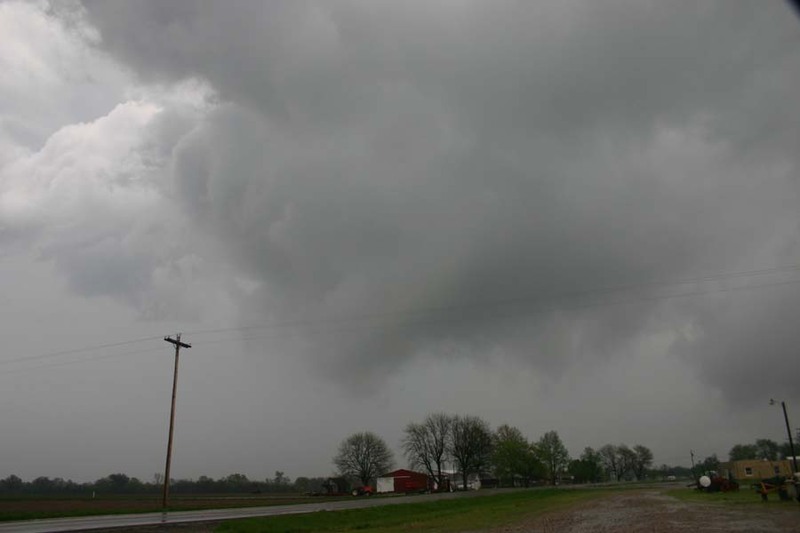 [A nice photo of the tornado, taken by spotter Steven L. Rudolphi of Watson, IL appears here, courtesy of the Effingham Daily News. I do not know how long they will keep this photo on the Web.] The tornado was rated F2 and was on the ground for 10 minutes and 4 miles. This is, unfortunately, not the first time a storm I was chasing decided to drop a tornado exactly at the time I was trying to push through a town to catch up or keep up with it - the same thing happened to me on May 5, 2001 in Cordell, OK. I guess that is part of chasing! The storm remained tornado-warned, so I continued to pursue it after FINALLY making it through Effingham. For the first few minutes, the meso remained rain-wrapped, but as I pursued the storm down route 33, the rain eventually lightened and I saw the wall cloud again, as well as other interesting lowerings down the flanking line a bit. I think this was most likely after the storm produced a second F2 tornado just west of Wheeler. I did see one lowering, I think between Effingham and Wheeler, that extended about 2/3 of the way to the ground - but I could not verify that it was rotating, and do not think it was the Wheeler tornado. It narrowed, then broke apart after a couple minutes. Again, I could not visually or on video see any rotation, though it was a rather mean-looking lowering. I continued to pursue the storm, eventually all the way to Robinson. 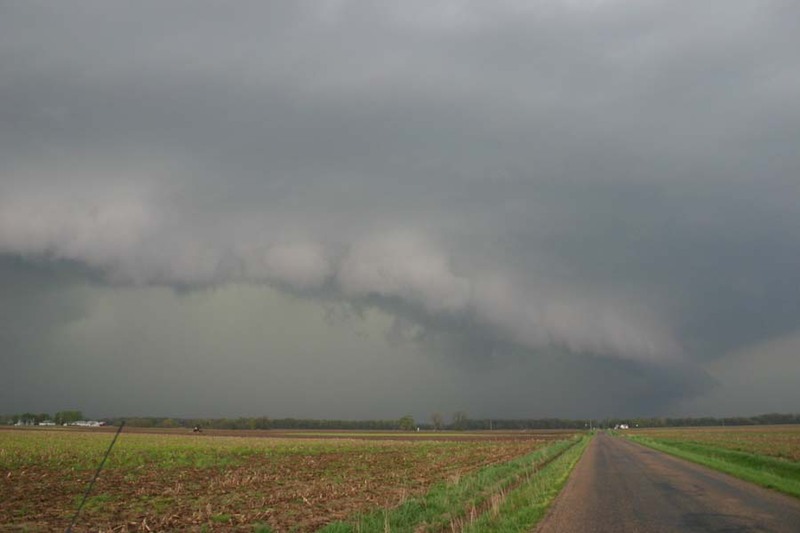 It remained tornado warned, bud did not produce any more confirmed tornadoes. 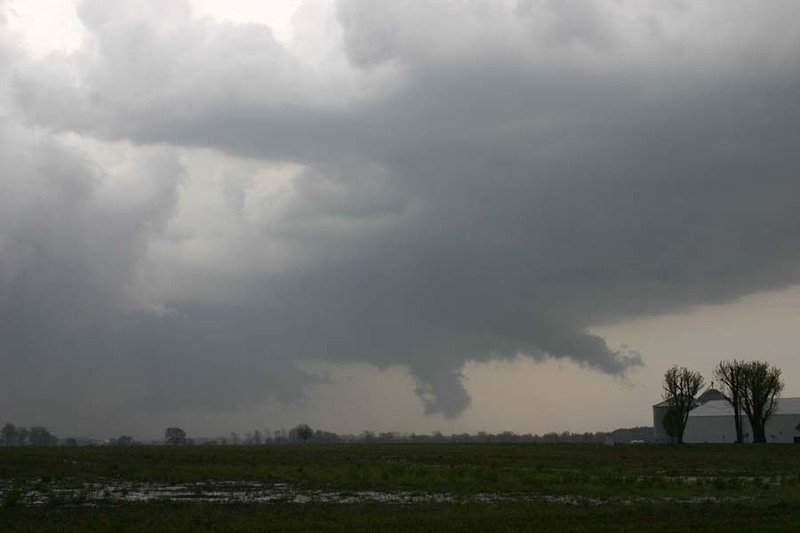 There were several tornadoes and funnel clouds in the preliminary LSRs around Oblong, but none of them were confirmed. 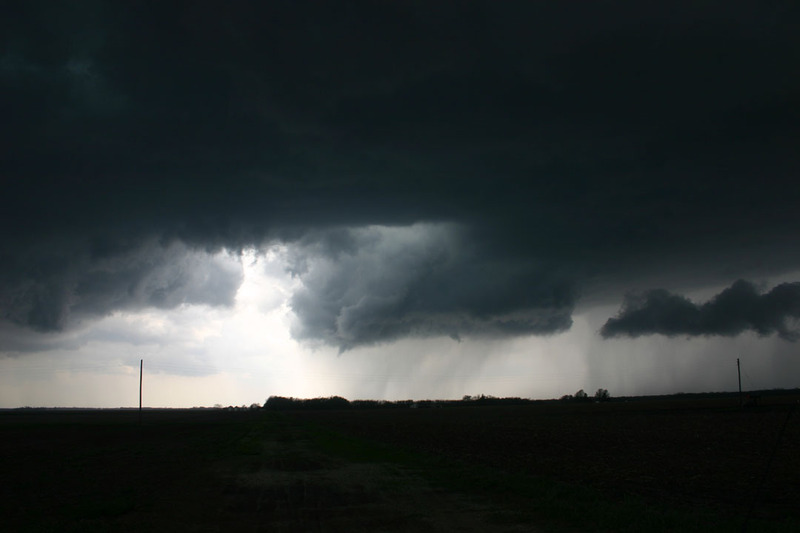 The wall cloud persisted, sometimes visible and sometimes hidden in rain. Several other suspicious lowerings also developed, but no tornadoes that I could see or even anything that I would confirm as a funnel cloud. Perhaps the most interesting was this one which was located just north of route 33 perhaps 8 miles west of Robinson. Just before pulling over and taking this photo, I was hit with a strong blast of wind from the north. When I reached Robinson, I realized the chase was over. I was still behind the storm, and nearly to the Wabash River, which forms the boundary between Illinois and Indiana. I stopped to get gas - the first place I tried was closed and its pump area was mostly flooded, but luckily I found another down the road. It was still very windy, and two interesting things happened as I pumped my gas: 1) a whirlwind spun through the gas pump area, sucking up water from the parking lot, and 2) the sirens blew, and a robo-voice announced "all clear, all clear." I started to work my way home, but as I did I faced a very nasty looking storm - actually more a line of storms - moving toward me from the west. 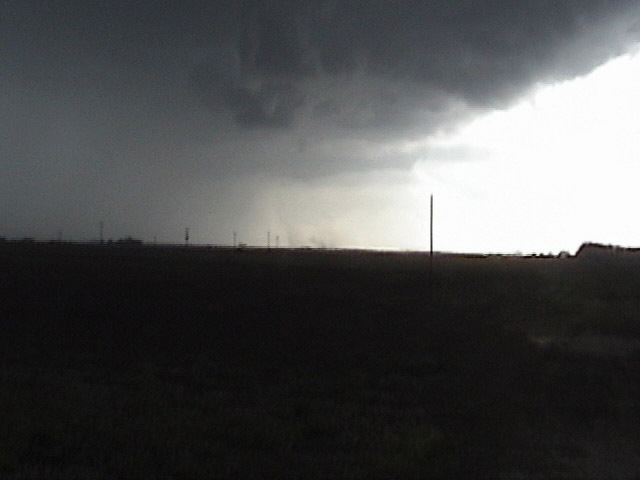 It looked outflow-dominant but very intense, and I decided it would be better to skirt around it than to drive into it. This was a wise decision, as soon it was SVR warned, and it produced golfball hail north of Newton and hurricane-force wind when it reached Robinson. But that is not all. As I worked south to get around it, I noticed a dark lowering along the gust front, under the shelf cloud and partly shrouded in rain. I figured it was probably just some scud, but the NWS soon upgraded the SVR warning to a TOR (so the "all clear" lasted maybe 15 minutes!) based on rotation 3 miles SW of Robinson, and indeed it has now been confirmed that a tornado touched down on the northeast side of Robinson. I got this photo of the storm as I worked south to get around it; the dark area under the shelf cloud just to the left of the road may the same lowering I observed; I am not sure, as I was driving to get out of the way of the storm when the lowering was at its best from my viewing angle. Anyway, this picture was taken perhaps 5-10 minutes before the tornado in Robinson. Since the storm was backbuilding, it was not possible to entirely avoid it, but I did manage to stay out of the hail and high wind. Once I finally got past it somewhere on the section roads southwest of Newton, the next challenge became flooded roads. At one point I had to turn around due to water over the road; I took the "Impassible during high water" sign that I saw just before the flooded stretch seriously. Indeed, there were people that had to be rescued from floods that evening, in addition to those who suffered tornado damage. 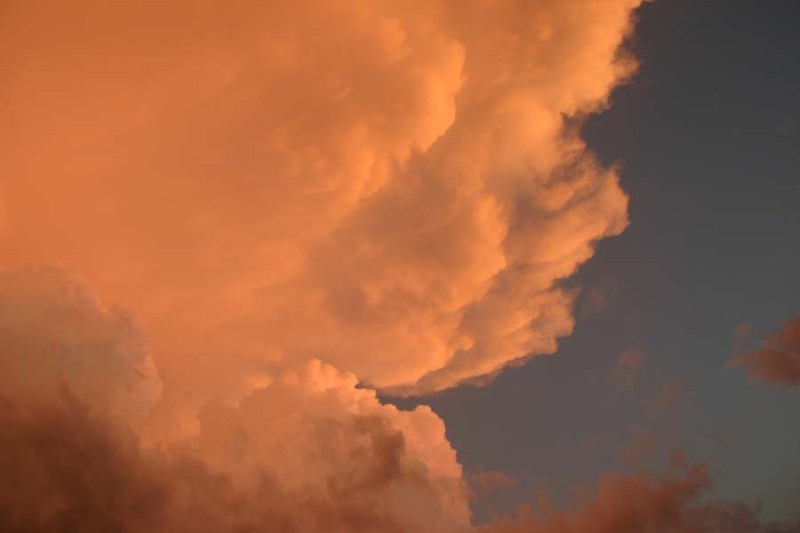 Once I made it back to Newton, the tail end of the line of storms was directly to my south, and the setting sun colorfully lit up the updraft towers and anvil. Here is one of the several pictures I took at this time. All in all, this was a great day of storm observation. I wish I had been able to photograph the tornado southeast of Effingham, but am pleased to have seen it, and also pleased that I was able to photograph a number of other interesting features, including what I now know was a brief spinup tornado between Taylorville and Assumption. When I got home around 10 p.m., I was tired, after being in active chase mode for nearly all of the nine and a half hours I was on the road. A Public Information Statement from the Lincoln NWS listing all of the day's confirmed tornadoes in their CWA can be found here. I would welcome hearing from anyone else who was on this storm; you can email me at jfarley@siue.edu.